Nola Zirin is a New York native and maintains a studio in Long Island City, New York. She received a bachelor's degree from New York University, where she studied painting with Milton Resnick and George Ortman. She also studied printmaking with Bob Blackburn and Donn Steward. Her work has been shown in many one person and group shows throughout the United States and abroad, most recently with her 8th solo exhibition at June Kelly Gallery in New York City. She is represented in numerous public and corporate collections, including the Metropolitan Museum of Art, MOMA, the Brooklyn Museum of Art, the Zimmerli Art Museum at Rutgers University, the National Museum of Taiwan and the Library of Congress. Zirin's shows have been reviewed in Artnews (Cynthia Nadelman), Art in America (Cathy Lebowitz), Art News (Ruth Bass), Philadelphia Inquire (Miriam Seidel), The New York TImes (Helen Harrison and Phylis Braff) among others. Zirin is a member of the American Abstract Artist Association. My paintings navigate the use of geometric abstraction in the construction of imaginary environments. The complexity of each individual painting, with their virtual orbs, mirrors the macro and micro layers of a fractal geometric space. This combined effect creates a 3-dimensional quality on a 2-dimensional surface. 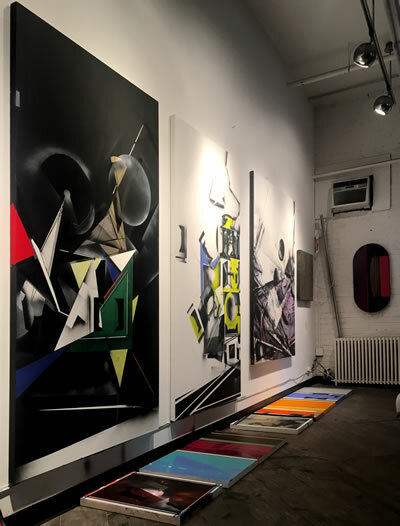 With confident brushwork and the orchestration of layered forms I playfully challenge the viewer with a host of visual surprises - splashes of vibrant color, chaotic shapes, non-traditional materials such as spray paint, glitter and flouncing pigment - all synergize to invigorate my geometric space.